MAGIK promises to deliver perfection with every product by its evaluation and assessment techniques designed with a higher degree of professional competence. Along with its existing abilities and a strong quality system, its certifications from the Bureau of Indian Standards ensure that standardized products have gone under surveillance carried out by qualified professionals only. 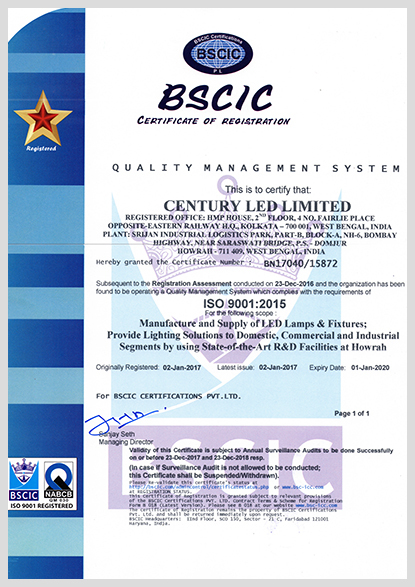 Century LED's strive for quality is achieved through the successful implementation of Quality Management System i.e. certifications of ISO 9001:2015 which is based on enterprise risk assessment and optimized mitigation of the same through an excellent team and state of at infrastructure and market driven research and development to cater the customer requirements. This standard ensures Safety of Lamp Control-gear for LED Modules. The control gear specified in this standard are designed to provide constant voltage or current at SELV (Safety Extra Low Voltage) or higher voltages. Deviations from the pure voltage and current types do not exclude the gear from this standard. This Indian Standard was adopted by the Bureau of Indian Standards, after the draft finalized by the Illumination Engineering and Luminaires Sectional Committee had been approved by the Electrotechnical Division Council. This standard covers the safety and photometric requirements. This series consists of photometric requirements that have been incorporated, that specify requirements for fixed general purpose luminaires for use with tungsten filament, tubular fluroscent, LED, LED modules and other discharge lamps. IS 16102 certification specifies the safety and interchangeability requirements, together with the test methods and conditions, required to show compliance of LED lamps with integrated means for stable operation, intended for domestic and similar general lighting purposes. This standard ensures that the products cause no danger to the user or surroundings.